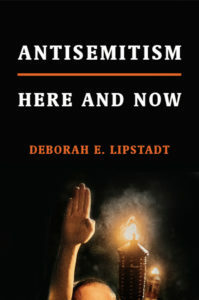 In Antisemitism: Here and Now, the award-winning author of The Eichmann Trial and Denial: Holocaust History on Trial offers a provocative analysis of the hate that will not die, focusing on its current, virulent incarnations on both the political right and left, and what can be done about it. When newsreels depicting the depredations of the Holocaust were shown in movie theaters to a horrified American public after World War II, it was believed that the antisemitism that was part of the fabric of American culture in the 1920s and 1930s was finally going to be laid to rest. In the ensuing decades, clauses restricting where Jews could live were declared illegal, the KKK was largely litigated out of existence, and Joe Lieberman almost became the first Jewish vice president. Yet over the last decade, there has been a noticeable uptick in antisemitic rhetoric and incidents from college campuses in the U.S. to terrorist attacks against Jews throughout Europe and most recently, the tragic hate crime at the Tree of Life Synagogue in Pittsburgh. The re-emergence of the white nationalist movement in the U.S., complete with Nazi slogans and imagery, has brought to mind the fascist displays of the 1930s. Where is this hatred coming from? Is there any significant difference between left-wing and right-wing antisemitism? What role has the anti-Zionist movement played? And what can be done to combat this latest manifestation of an ancient hatred? Lipstadt is a professor of modern Jewish history and Holocaust studies at Emory University. Actress Rachel Weisz portrayed Lipstadt in Denial, a film based on her book History on Trial: My Day in Court with David Irving. In conversation with Rabbi Shira Stutman, the Senior Rabbi of Sixth & I. Book signing to follow.